If you think this is a good idea, you officially have too much money. The "bling" accessories pose a serious risk to babies and children and were found for sale across the county, a spokesman said. The county council has warned parents not to buy the items, which have failed all safety tests. Investigations into the source of the products are continuing. 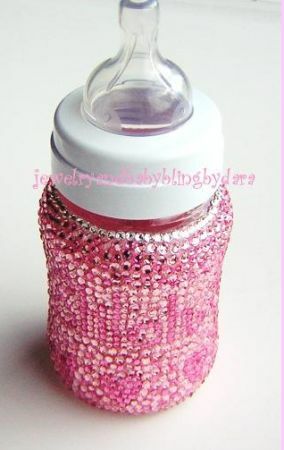 The dummies and baby bottles were found to be genuine brands with hand-glued gems, beads and magnets added to them. Beads had also been threaded on to dummy clips, all of which could result in choking, inhalation or ingestion, the county council added.